Sunday always seems to be the perfect day for brunch. Late and slightly lazy mornings feel like such a treat, especially when you’re up as early as I am every day! So, I absolutely jumped at the chance to sample Montpelier’s brunch menu. They’ve just been named as the best brunch in Edinburgh by ion magazine, so, as you can imagine, I went with high expectations! Situated in Bruntsfield, we parked the car nearby, and when we got in, we were met with possibly the cutest Christmas decorating in the whole of Edinburgh. 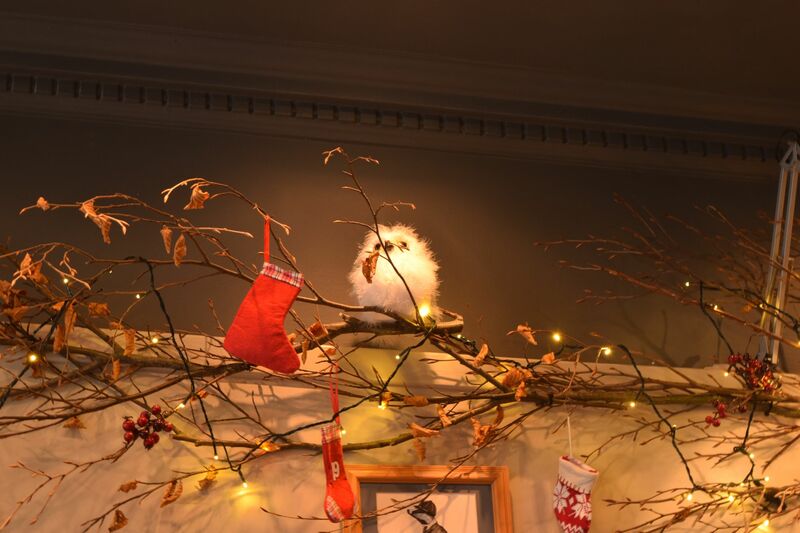 Everywhere you looked there were fluffy little owls perched alongside teeny stockings and berries. 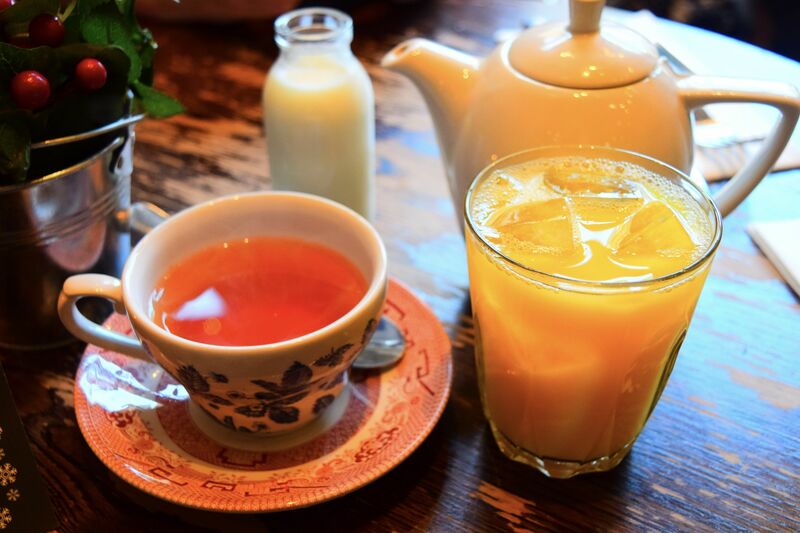 We settled down to the task of ordering, we got some tea and orange juice to keep us going. The restaurant had a really wonderful atmosphere – buzzing with groups of friends, families and couples, all enjoying a bit of a morning treat. There was even the most adorable maltese sitting under a neighbouring table, which was very difficult not to offer treats to! Since we were in to see what was on offer, we had to order the The Full Monty (£11.95). 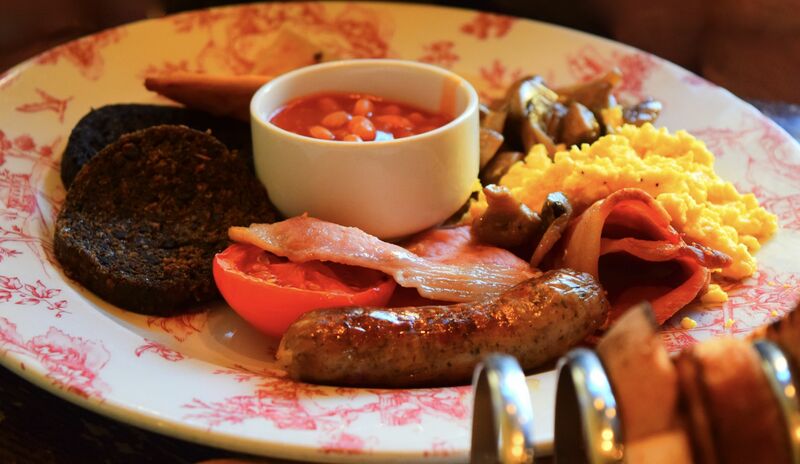 This really is a breakfast fit for a king, and comes with a pot of tea and a glass of orange juice. If you’re after something to really set you up for the day, this is it! 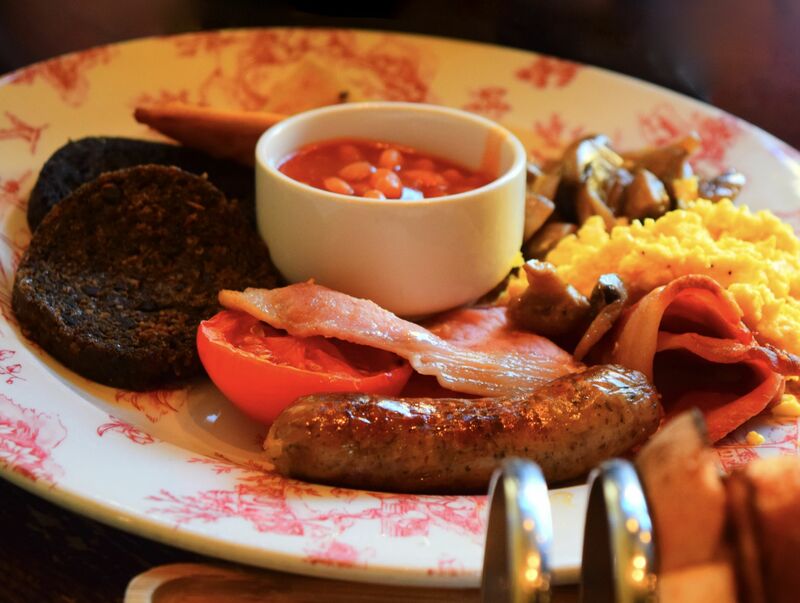 The Full Monty is literally everything you could imagine in a breakfast on one plate. Fluffy eggs, baked beans, bacon, sausage, haggis and black pudding all competed for space with a rack of fresh toast and a potato scone. Considering we had dived into Montpeliers out the rain, it was really a perfect winter warmer of a dish. I admit to nicking a bit of sausage, and it was absolutely delicious – flavourful and herby, everything was so fresh and flavourful, we were more than a little disappointed when we couldn’t quite finish it! 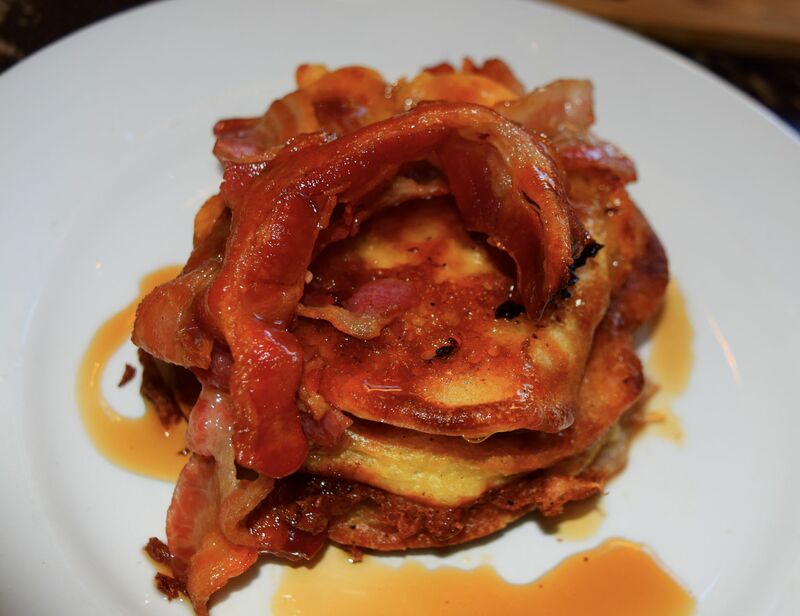 When I saw I could order a stack of pancakes, complete with maple syrup and crispy bacon (£5.95) there wasn’t another choice for me. 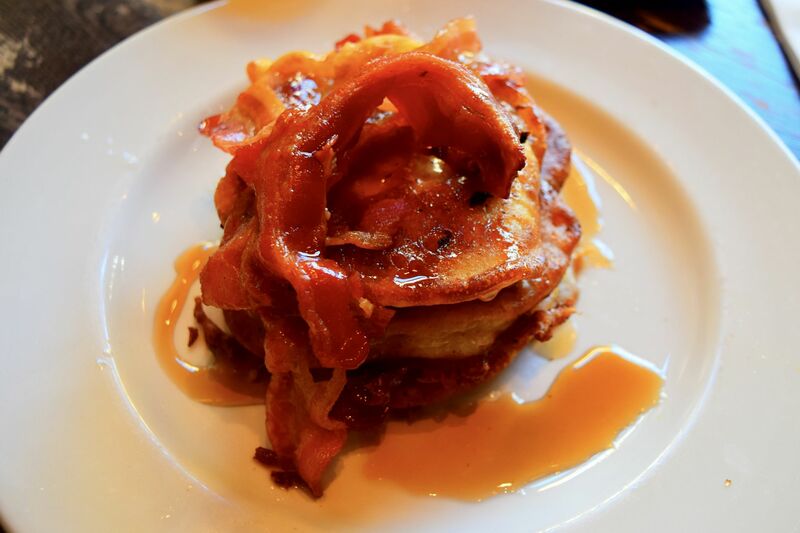 There’s something about fluffy pancakes smothered in syrup that’s just delightful, and then the addition of bacon (especially when it’s crispy) just makes it heaven. The stack was three pancakes high, and they were absolute perfection! With crunchy outer edges and soft, fluffy centres which just sucked up the syrup, the dish was exactly what I was after! It was such a treat to be able to sit on a weekend morning, and really enjoy breakfast. Sitting in the window of Montpeliers, we got to people watch (my favourite) and really savour the morning, soaking up all of the restaurant’s convivial atmosphere. It was such a lovely way to spend an hour or so! Also, I just wanted to draw attention to the amazing initiative that the restaurant is currently running. 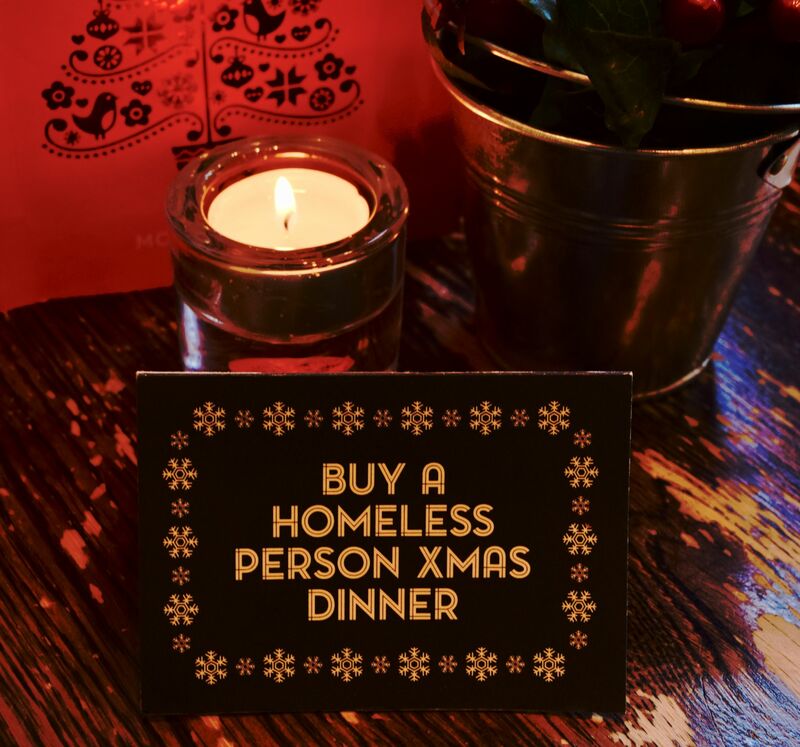 If you’re dining (or just having a drink) you can add a couple of pounds onto your bar bill, and it means that a homeless person will be able to enjoy a hot Christmas meal. If you’ve been in the city centre recently, you will have noticed how many people need our help, especially in this cold weather, so I really appreciated the gesture. Thank you so much to Montpeliers for having us! 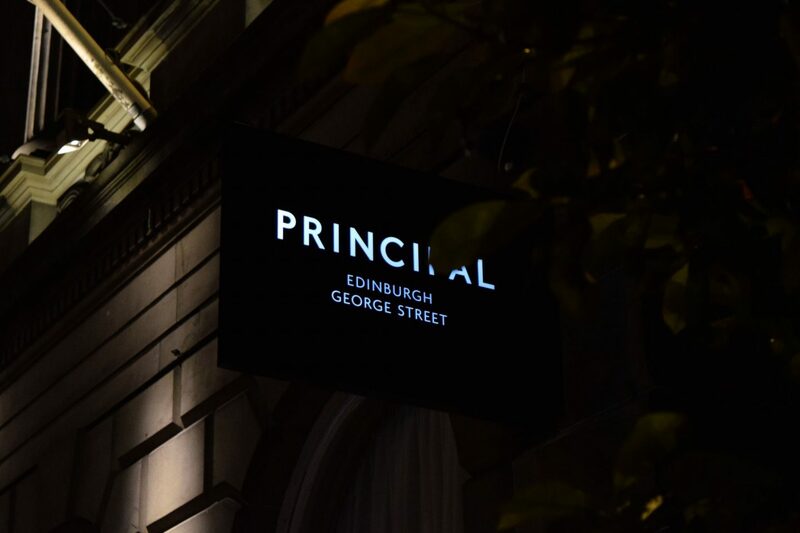 If you’ve been on George Street recently, you might have noticed a bit of a renovation going on over the past few years, as the George Hotel has been transformed into The Principal Edinburgh. 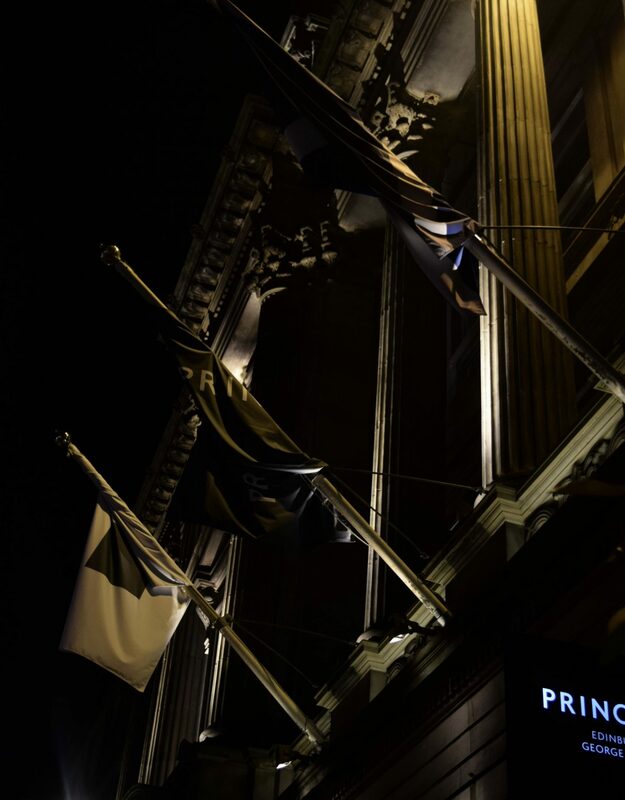 The building is one of the city’s grandest, and the hotel spans what was once a bank, three Georgian townhouses, as well as a more modern addition to the rear. It’s an absolutely glorious building, and by far the best hotel in Edinburgh. 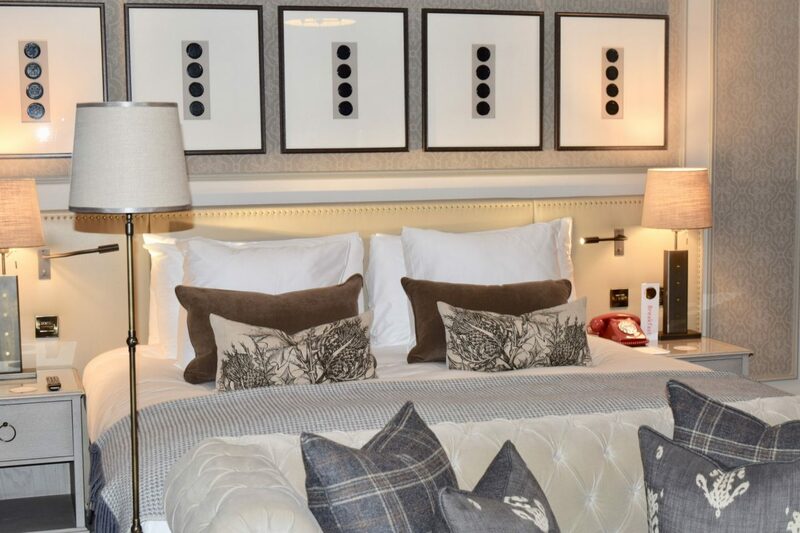 There is even a coffee shop (Burr & Co) and restaurant (The Printing Press) onsite, meaning that if you’re lucky enough to stay in the hotel, you don’t even need to step outside, whilst still enjoying some of Edinburgh’s best spots! 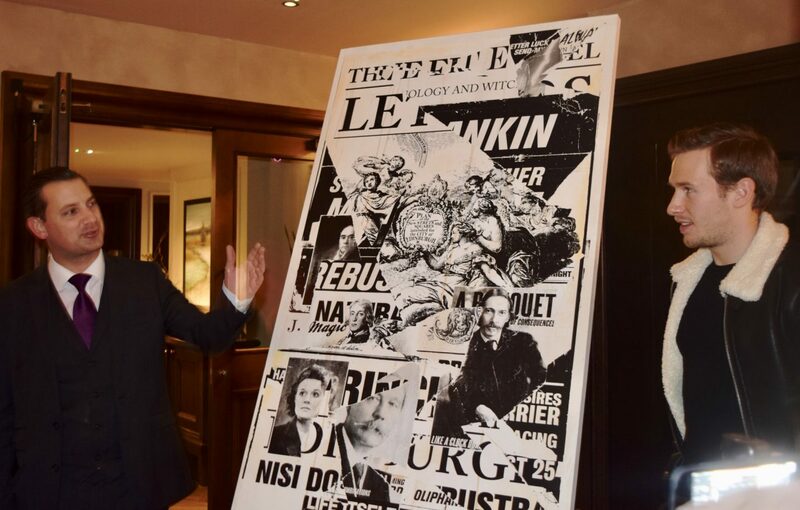 As well as getting to have something of a nose around the hotel, we had been invited for the official unveiling of a specially-commissioned artwork by British artist Charlie Anderson, to celebrate the hotel’s new look. We gathered in the bar of the Printing Press, sipping on signature vodka cocktails (Kelpies) or seriously strong Old Fashioneds whilst General Manager Andreas Maszczyk introduced Charlie and explained a little about the renovations. The artwork celebrates the best of Edinburgh – portraits of some of some of the city’s most prominent citizens are scattered throughout the piece, interspersed with a quotation from Sir Walter Scott. The top etching is taken from the original plan for the building (when it was still a bank) and it’s a really lovely representation of all that Edinburgh has to offer. We then heard from Charlie about the creation process and how he incorporated all of the elements of the piece together. Then it was time to head upstairs to have a bit of a nosey at the rooms. We were shown to one of the hotel’s Junior Suites. Overlooking George Street, we could see the sparkling lights shimmering through the curtains, but it was absolutely silent. Then, sipping on prosecco, we got to have a real look around and hear more about the hotel in general. The room itself is absolute perfection. Decorated in soft greys and whites, it’s exactly how I want to redecorate. With a velvet chesterfield at the bottom of the bed, and soft flannel drapes, I can’t imagine a better place to wind down. 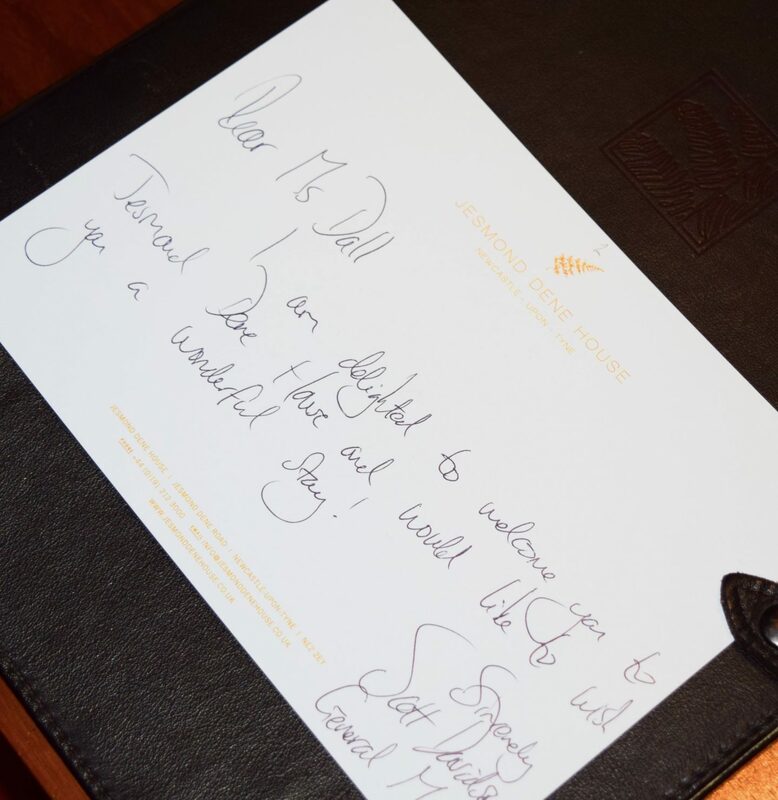 It was so lovely to hear Andreas talk about the hotel – the level of service and comfort that Principal Edinburgh prides itself on is seriously impressive. Every room has an old-school red phone which can pretty much grant every wish in under an hour. Whether you want to order room service or theatre tickets, it will be at your door in under 60 minutes! 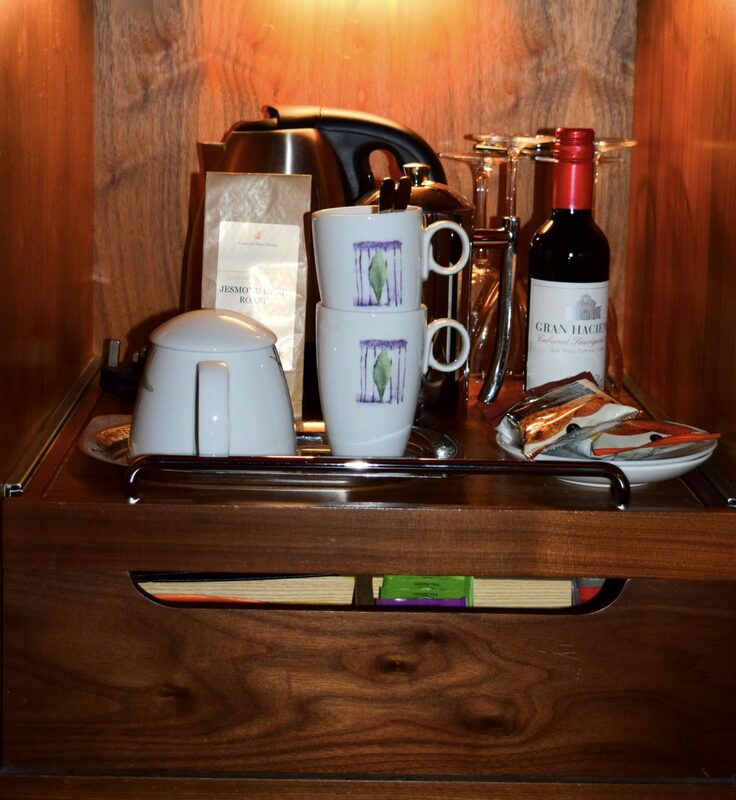 We were also shown all the extra little touches in the room – rather than an overpriced minibar there are complimentary tuck boxes, and the framed and wall-mounted televisions are all equipped with Netflix and the like, meaning you can sit back and enjoy a couple of episodes of your favourite shows. The hotel is now pet friendly too! Four legged guests are provided with their own beds and bowls, meaning they get as much of a treat as you do! 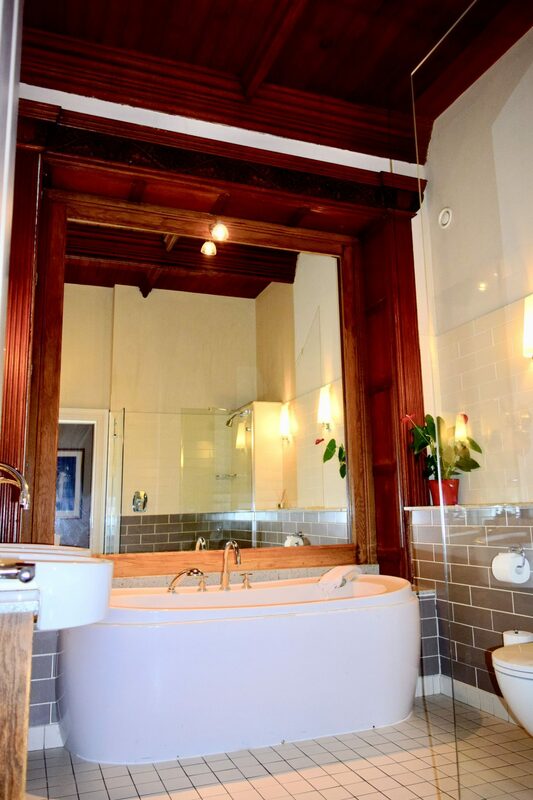 The bathrooms are just as dreamy as the bedrooms too! 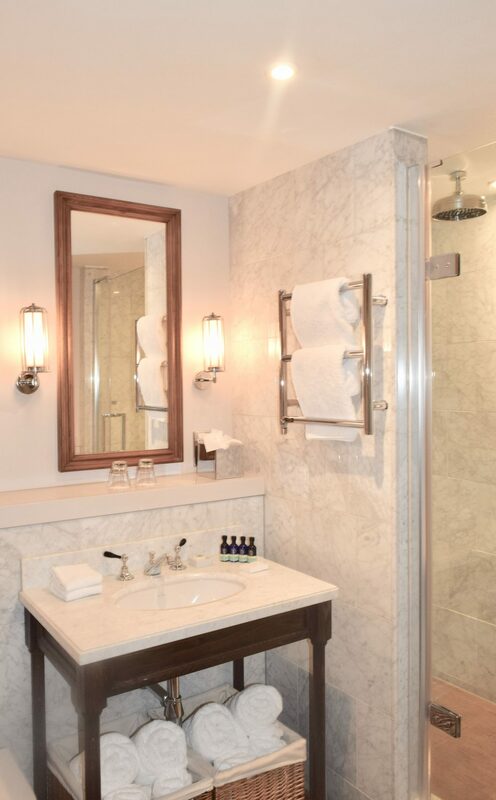 The suite’s was an absolute confection of white marble, fitted with a glorious roll top bath and rain-fall shower. Also, they are using one of the best water softener for water softening. 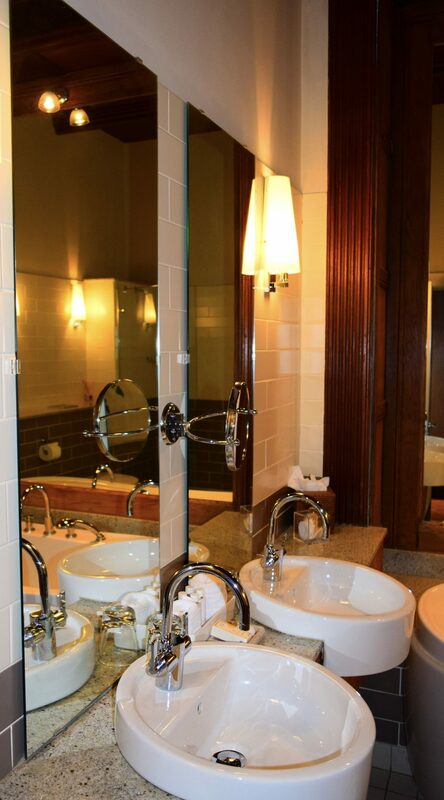 All the rooms in the Principal Edinburgh hotel rooms come with these showers, which sound absolutely incredible! We then got the chance to explore the Forth View Suite, which has the most wonderful views over the skyline of Edinburgh. Getting to pop outside and see the castle all lit up was incredibly special. Unsurprisingly, it’s already booked up for New Years! 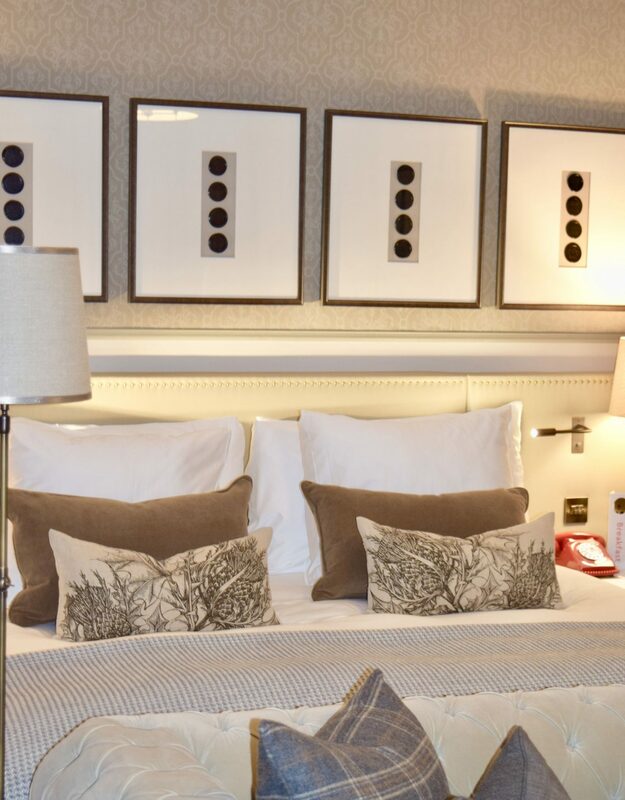 Rooms at the Principal Edinburgh start at £149 per night and you can find out more here. Edinburgh’s West End is inviting you to come and take a closer look this Christmas, exploring its full range of unique events and themed master classes throughout the month of December. 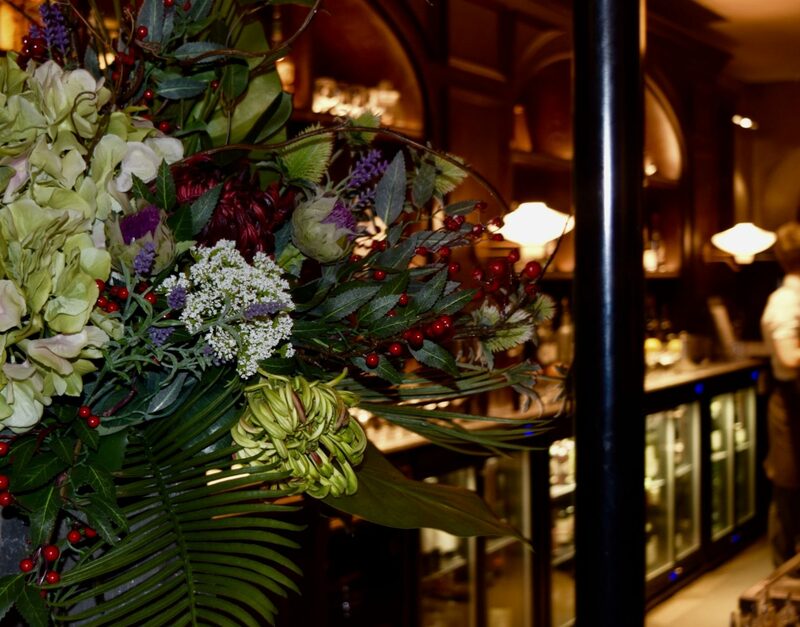 This is a very exciting time for Edinburgh’s West End which is constantly growing with a number of stylish boutiques, luxury hotels, fine dining, traditional pubs and modern bars. As well as a range of hair & beauty salons and spas– providing the very best in style and well-being with some of the finest places to visit in the city. 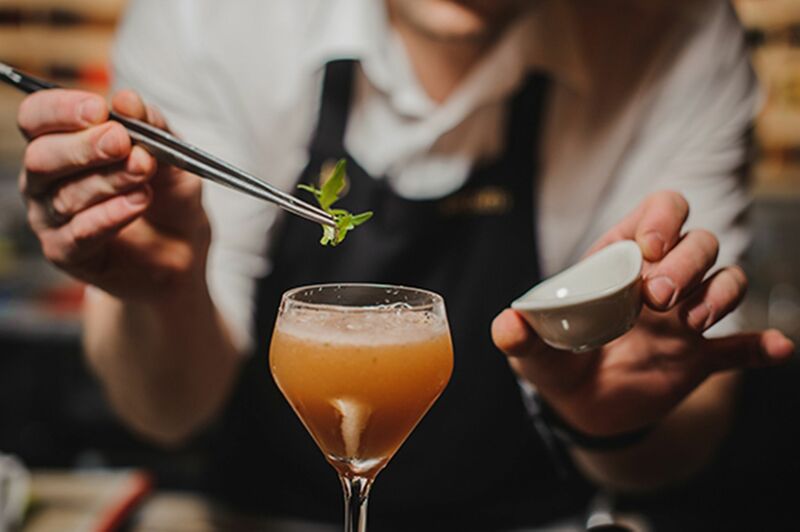 Throughout December, Edinburgh’s West End will host a number of themed master classes and pop up events as well as a unique Christmas Concierge Service to organise all of your shopping with a personal touch in the run up to the big day. This service will run on the 8th, 15th and 22nd of December. Some of the festive master classes include: Breath Works – An introduction to mindfulness and meditation. If practised regularly, can help you to relax, feel happier and more content. Glam Candy – Skincare and Make-up master class with a demonstration from a professional make-up artist. Just g Boutique – Fashion Colour Master Class to discover the styles and colours that will make you shine this season. 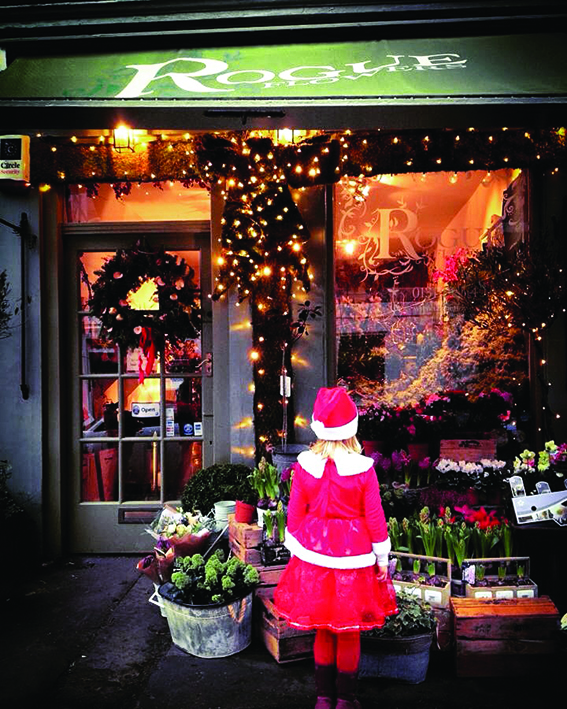 Rogue Flowers are hosting a pop up shop for Christmas with a number of in house master classes as well as their very own Christmas Grotto. A full list of the calendar of events and activities taking place within Edinburgh’s West End throughout the festive period will be available on their facebook page – https://www.facebook.com/EdinWestEnd/ from Sunday 20th November, as well as a weekly ‘Take A Closer Look’ social media competition starting on the 5th of December. For further information and booking details please keep up to date with their social media in the run up to December. Just over a fortnight ago, I took a week off work for the first time in what felt like a lifetime. Realistically, it’s more like a year, since I had so much time off, but it was very much needed! To make best use of the time, we decided on a bit of a road trip to explore down south and see a little more of England. Whenever I have a spare weekend, I tend to find myself in Cheshire, so, on this trip, I wanted to venture a little further afield. 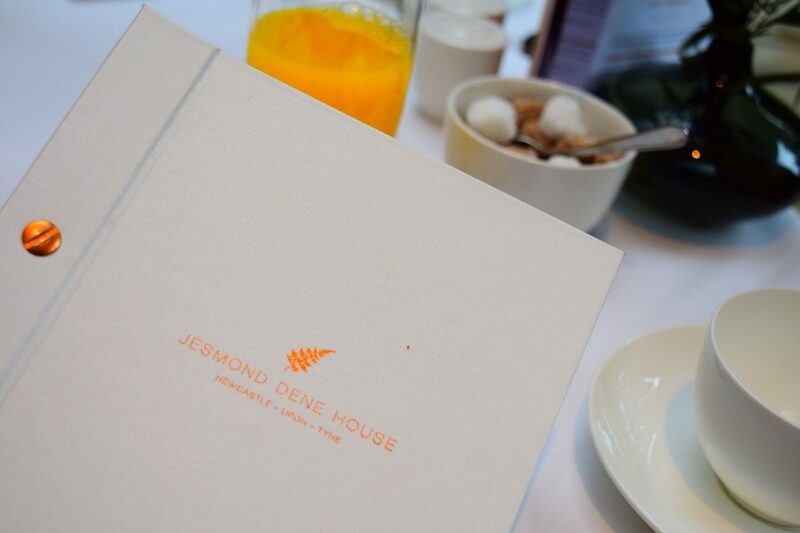 The first stop was the stunning Jesmond Dene House located in the centre of Newcastle-upon-Tyne. 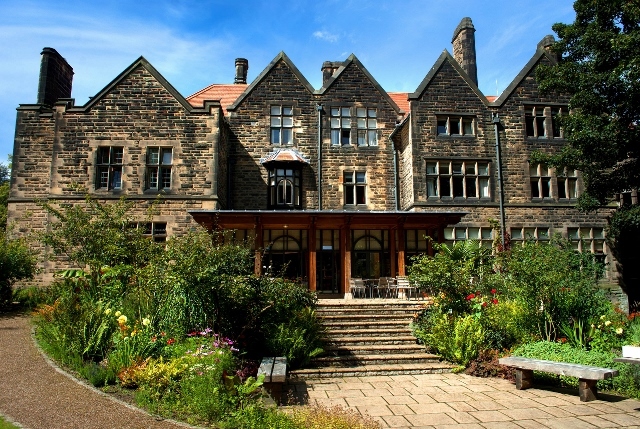 I’ve never really visited Newcastle before (unless a school choir competition counts), and since it’s only about a two hour drive from Edinburgh I don’t really have an excuse, but since visiting the stunning Jesmond Dene House, I think I’ll be back far more regularly! 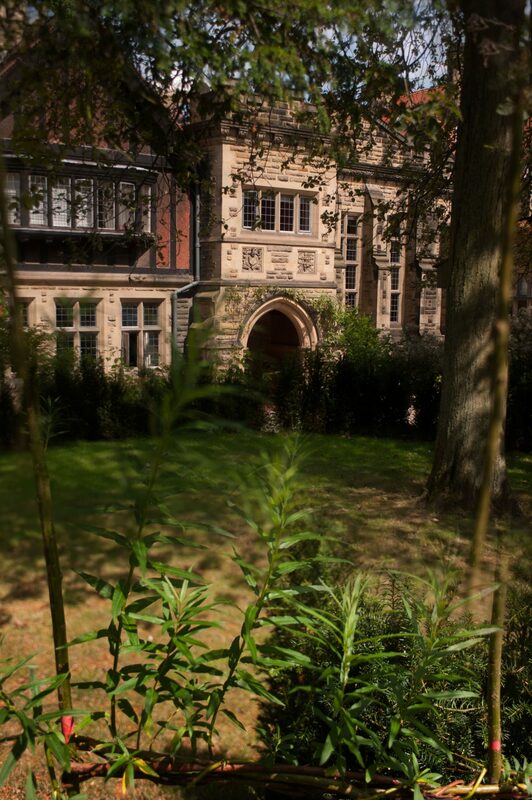 The hotel is situated in the centre of the city, within a stunning parkland. It was built as a mansion for a Victorian industrialist, and you can only imagine our oohs and ahhs as we drew up in the pouring rain. 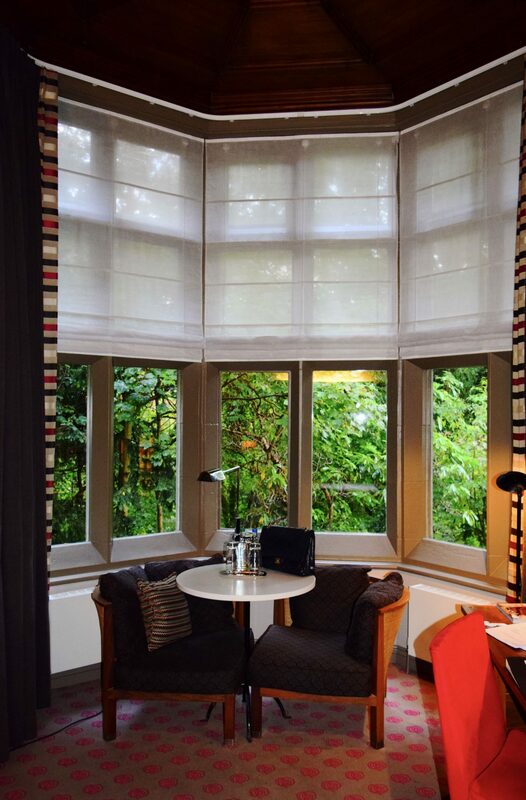 The hotel is a study in Arts & Crafts architecture, and is absolutely stunning. After trying to dodge the rain to take a few photos, were were ushered inside by the concierge, who whisked away our bags, and showed us to our room. Honestly, the welcome couldn’t have been warmer, and it was absolutely fascinating to learn about the history of the house. 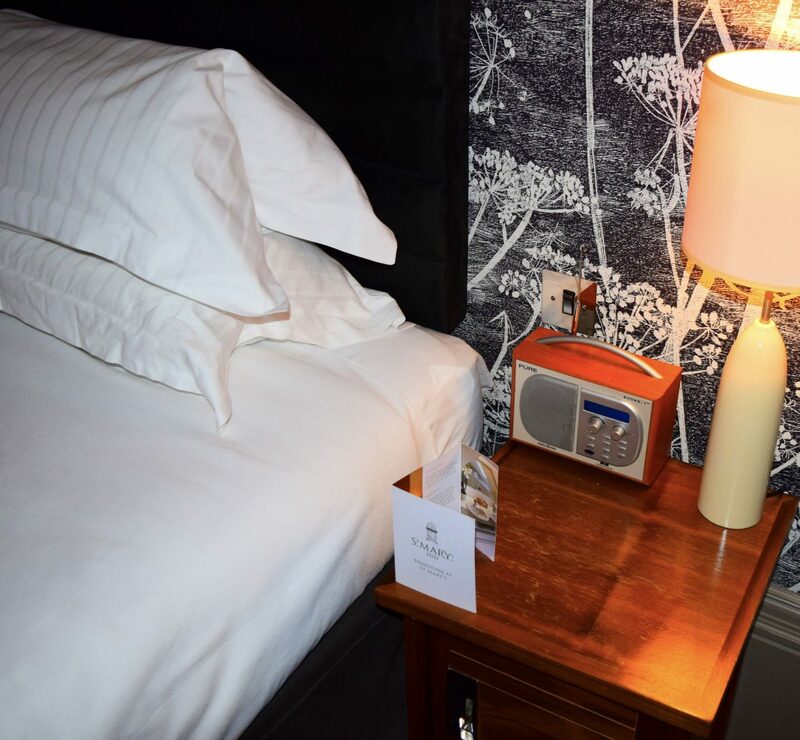 There are nods to the property’s history throughout – with photographs on the walls and original features in some of the bedrooms. We were shown to room 2, located just off the lobby, with views to the back garden, it was the perfect spot to spend a rainy evening. The room was previously a library, and benefits from almost double-height ceilings, turreted seating area, and copious original features. It was an absolute gem, and we couldn’t have been happier with it! I was absolutely obsessed with the nook, which overlooked the gardens. 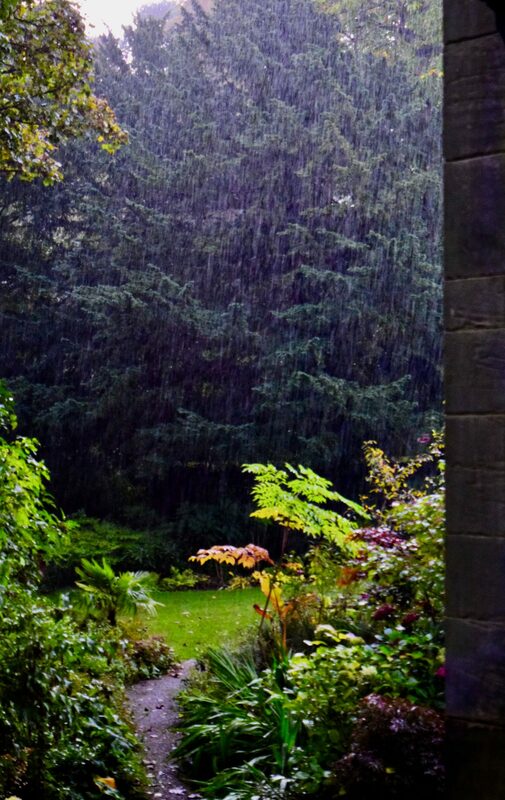 It was such a cosy little spot to answer emails and enjoy the rain pounding outside. 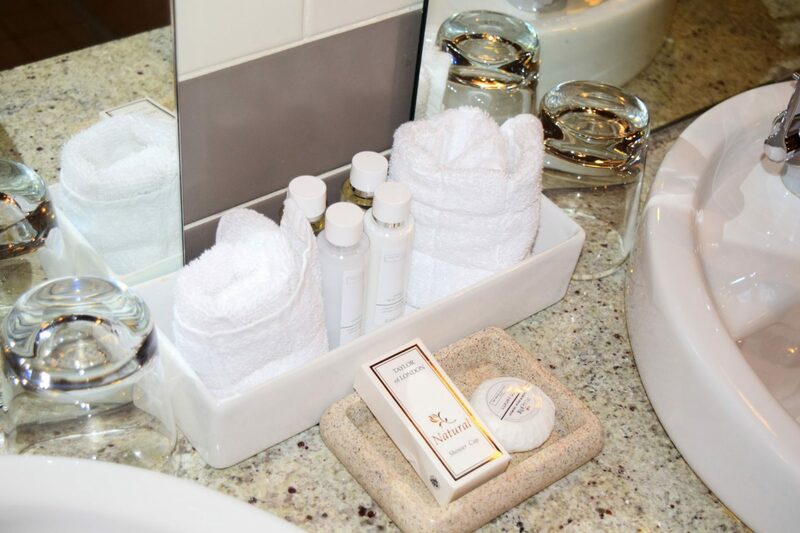 The room is fully stocked with everything you could possibly need. The wifi was super fast, and, importantly for a hotel, free of charge, and the cupboard was filled with fluffy robes, a mini bar and complimentary coffee and tea. Needless to say, we fixed ourselves a few cups of tea and settled down to enjoy watching the rain outside. 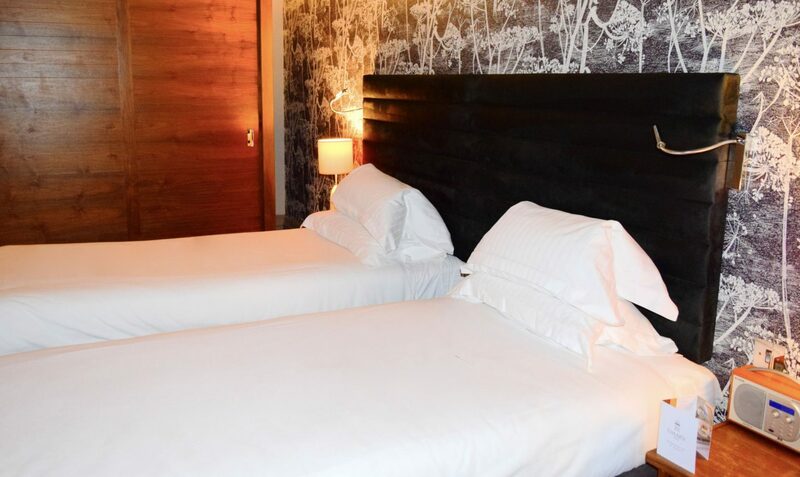 The room was wondrously spacious and benefits from a double bed, which can be split into two singles depending on your needs. 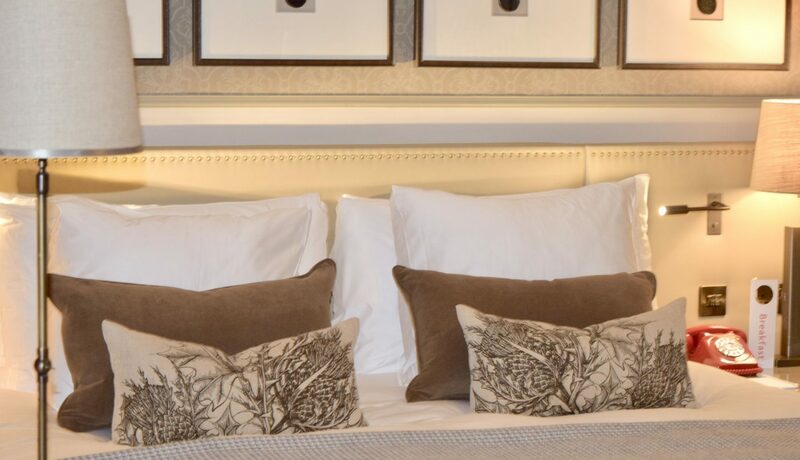 Swathed in super-soft white linens, they were absolutely heavenly, and so comfortable to lounge on! 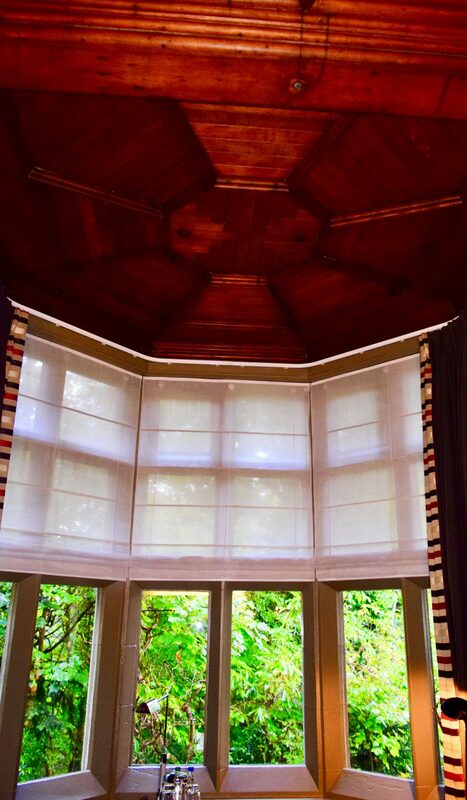 I loved the mix of contemporary decor within the traditional room, and it was the perfect place to relax and begin to unwind. After arriving we had a couple of hours to fill before our supper reservation (more on that tomorrow! ), so I did what anyone would, and drew myself a long, hot bubble bath. You can see why I wanted to spend so much time in the bathroom – it was stunning! With a huge bath which was perfect for wallowing in, as well as a double sized shower and two sinks, it was absolutely heavenly! 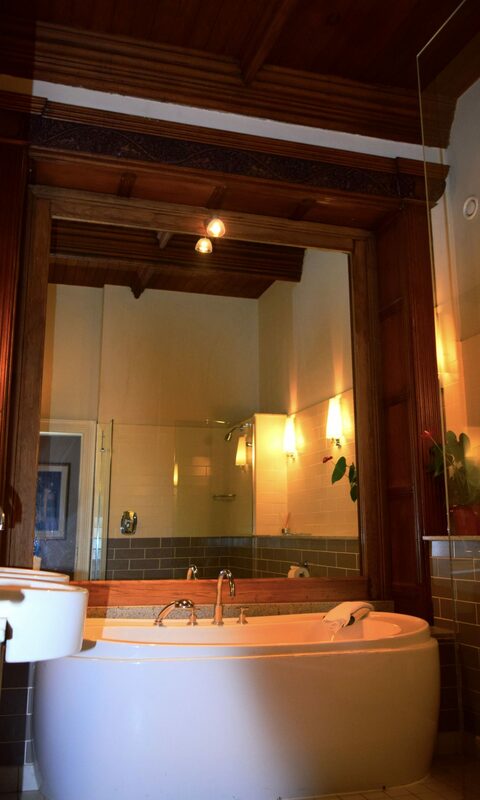 The bath was set beneath an original doorway, and getting to soak in a bath whilst sitting under all the carving was absolutely glorious! Despite being pretty much in the centre of town, the hotel was so tranquil, it was the perfect place to begin our vacation! Soon though, it was time to tear myself away from the room, for supper, which we enjoyed in the hotel’s dining room. 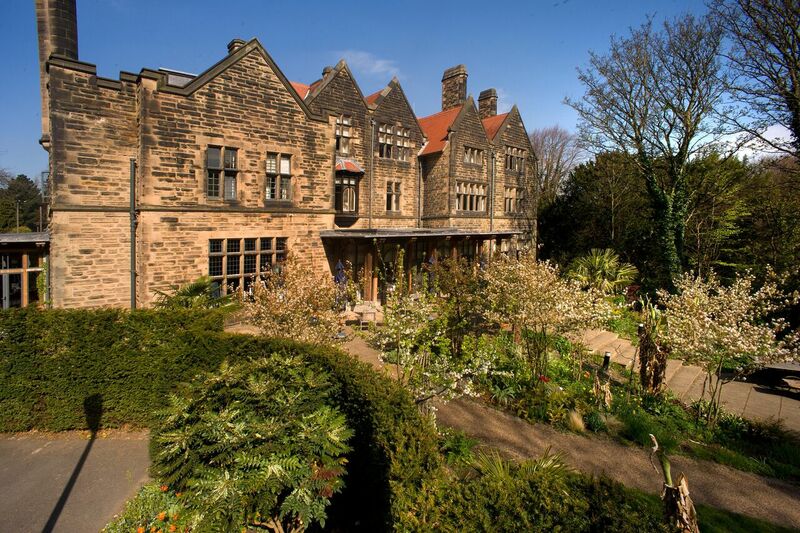 Jesmond Dene is probably best known for it’s restaurant which has been awarded with 3 AA rosettes. Honestly, it was one of the best meals I’ve had in a long time (and you can read about it tomorrow) and I can see why it’s so beloved. Positively stuffed, we were thankful that the room was only a few footsteps away, and sank into the beds. 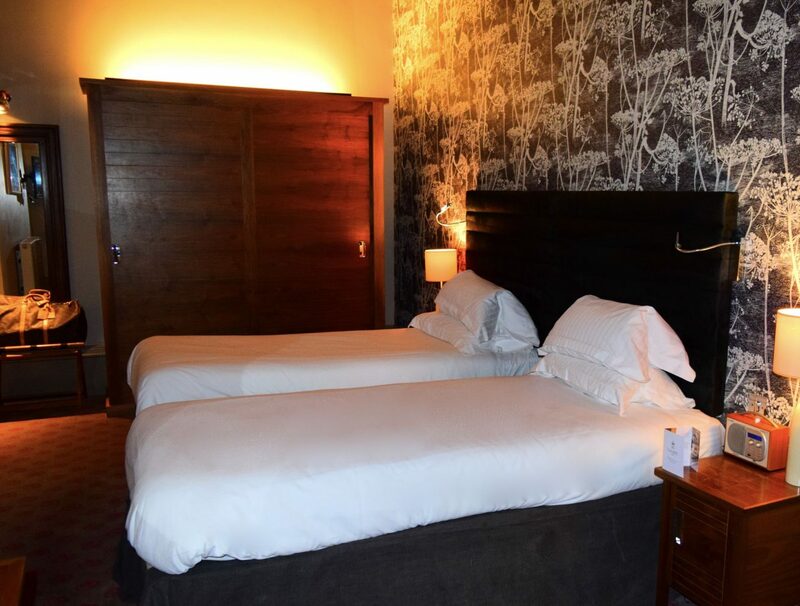 Perfectly comfortable, we both remarked on how well we slept, and how cosy the hotel felt. All too soon though, it was time for breakfast, which we enjoyed in the conservatory. Still full from dinner the night before, we didn’t really take advantage of the breakfast like we should have. 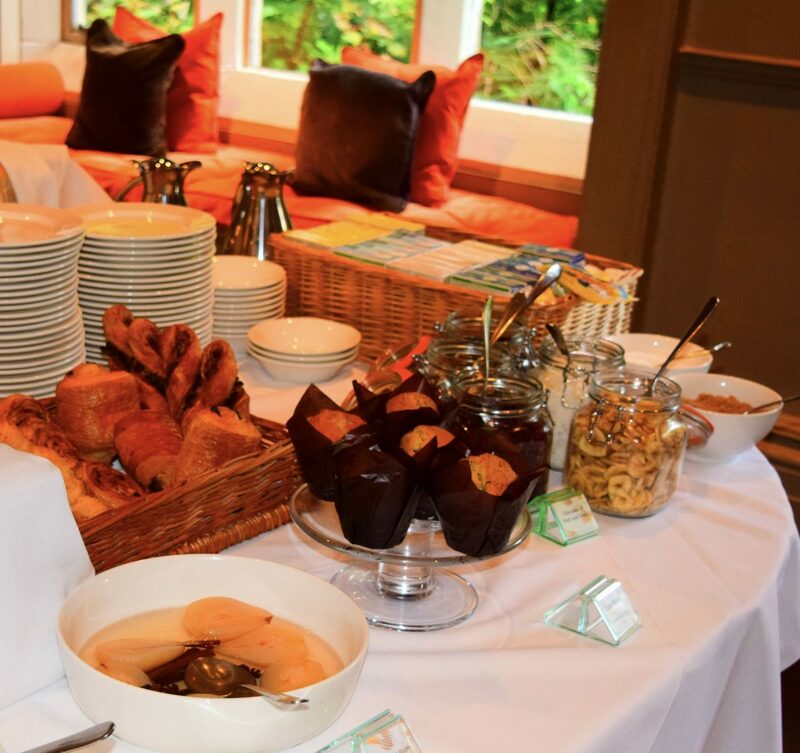 Guests are free to choose hot items from the menu (there are mouth-watering options including French Toast and Porridge which is served with a hint of Single-Malt Whisky and stewed fruits) or from the buffet – there really is more than enough choice for everyone. 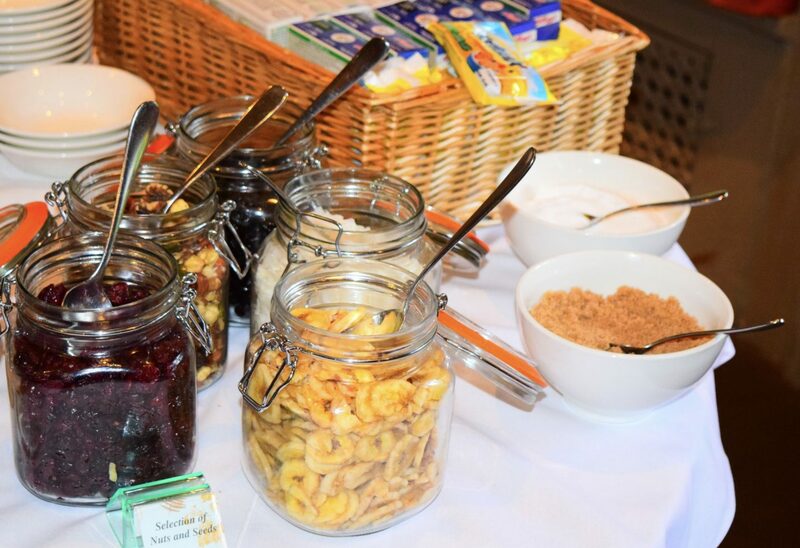 The buffet is a Continental affair, with a wide array of yogurts, breads, cereals, patisseries, meats and cheeses. 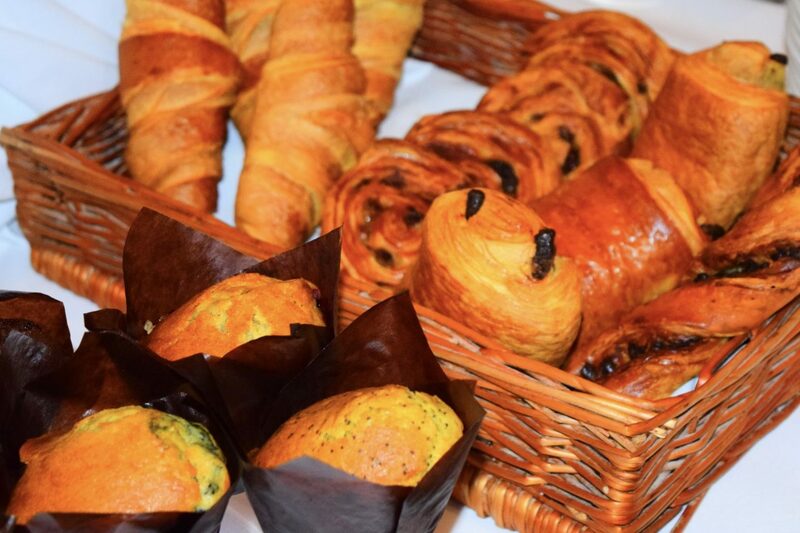 I so wish I had been able to squeeze in a pain au chocolate or muffin, as they looked and smelled absolutely divine! 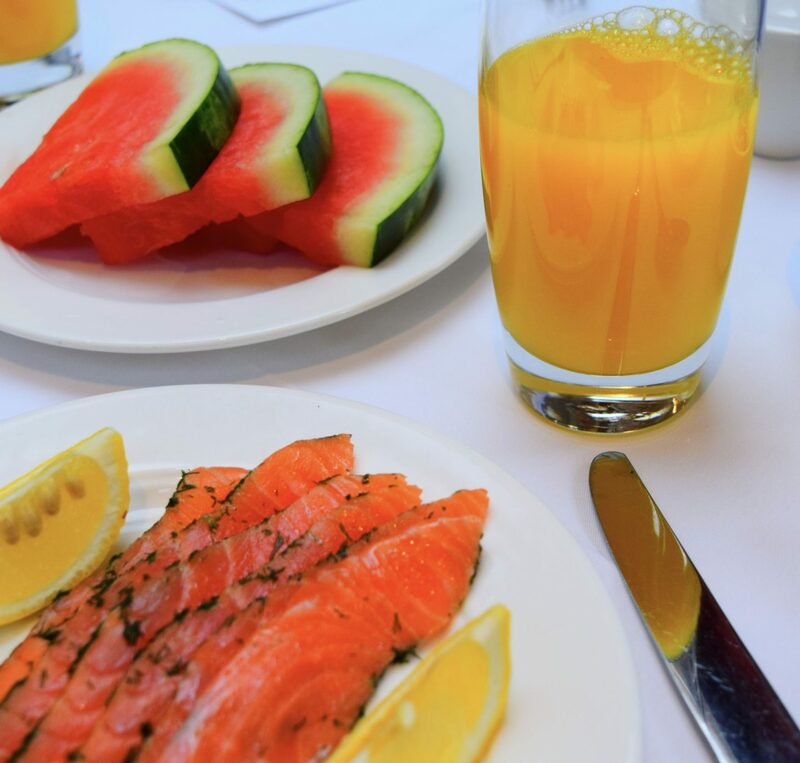 Despite the array, we chose to keep it simple, ordering black coffee and orange juice, and sharing a plate of smoked salmon and watermelon. Despite sounding simple, they’re some of my favourite breakfast foods in the world, and so easy to get wrong. At Jesmond Dene, however, they were perfection. The coffee was delicious, and strong enough to shake off any morning snooziness, whilst the orange juice was freshly squeezed and wonderfully zesty. 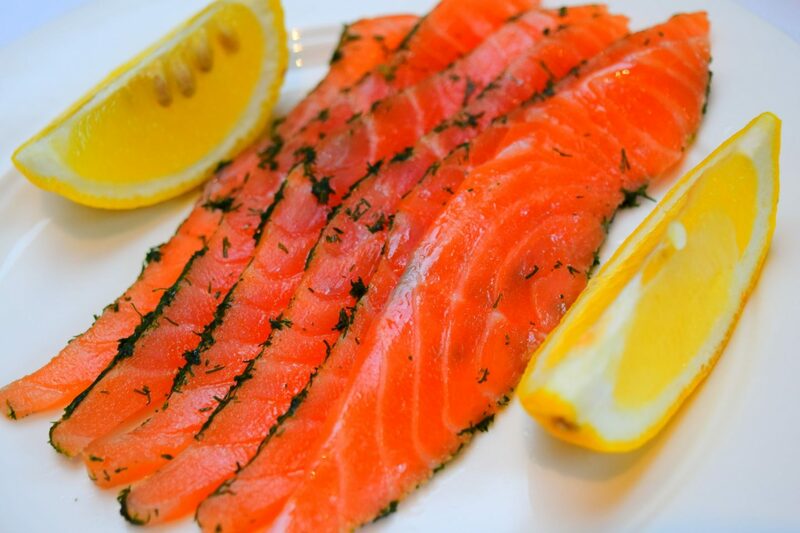 Our watermelon was perfect – firm and juicy, with wonderful flavour, and I’m still dreaming about the smoked salmon! Home cured in dill, it was rich and flavoursome, and the perfect way to round off a truly enjoyable stay. 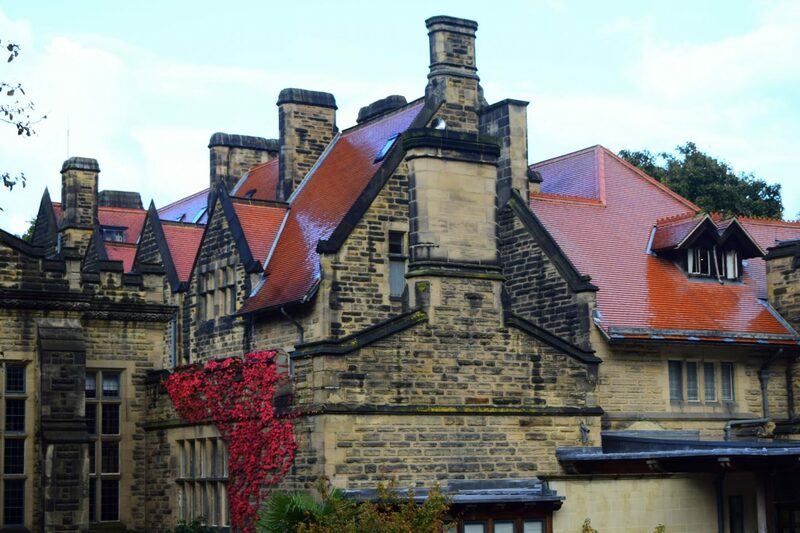 We both had an absolutely wonderful stay at Jesmond Dene House, and are already looking at dates for our return! Our stay was complimentary, but the room rate was £250 per night including breakfast. When it comes to cozy evenings in, I’m not sure if you can beat a great cheese board. 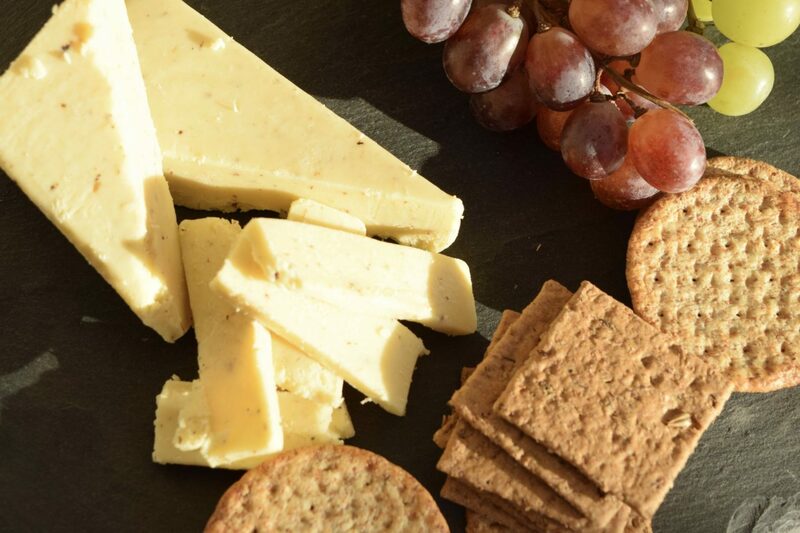 A few good cheeses, a sprinkling of crackers and some fruit is deceptively simple, yet incredibly satisfying. Add in a glass of champagne or prosecco, and I’m in heaven! 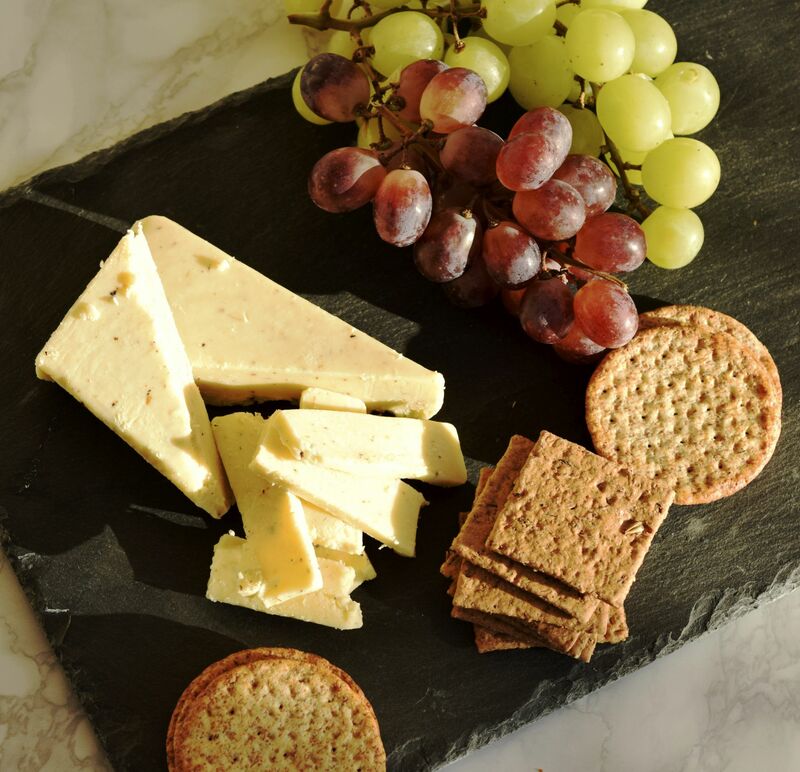 So, when I was sent some Truffler English Cheddar from Dorset Ford Farm, I couldn’t wait to give it a go. 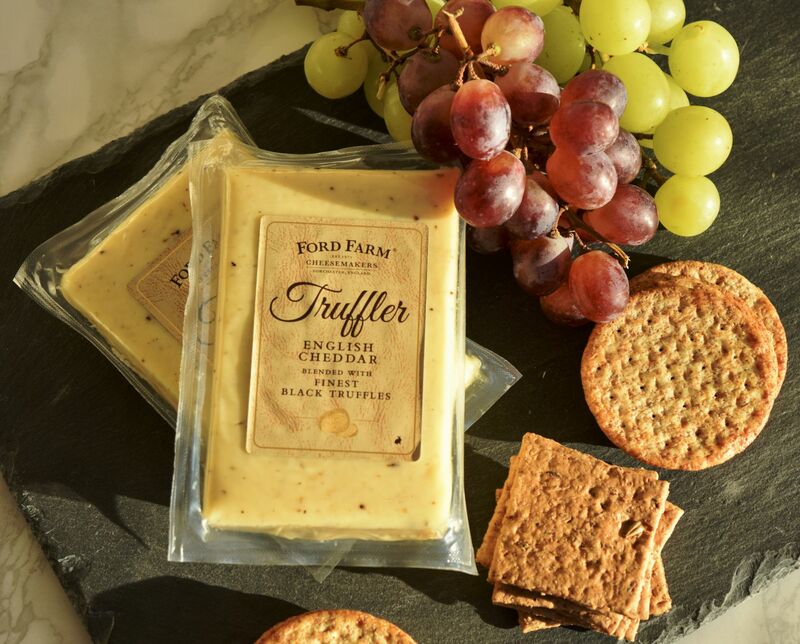 Ford Farm’s Truffler is a rich and creamy cheddar is studded with Black Truffle.The moment it’s out in the open, all you can smell is truffle, and it’s really dreamy. Rich and savoury, it’s just the thing if you’re in the mood for something decadent. I first paired it was wheaten crackers, grapes and pear, and it was delightful. The next day, though, when I was scouring the fridge for an easy supper, I happened upon a remaining chunk of the Truffle. Finely grated, I turned it into the most gourmet of toasties, andI have to say, it was rather impressive. The cheddar melted beautifully, and turned wonderfully gooey, whilst the bread stayed satisfyingly crisp. I’m already getting an order together, and I don’t want to mention the ‘C’ word too soon, but Truffle would make a rather perfect addition to a festive spread!